April Lark discovered her ability to tap into the world as an Empath early in her life. After learning how to successfully Shield, she was able to concentrate on connecting with others and tuning into their needs. In 2006, an enchanting deck of Russian Gypsy Fortune cards found their way into April’s life and chose her. Since then, several other delightful decks, including the Deviant Moon Tarot, have followed suit. 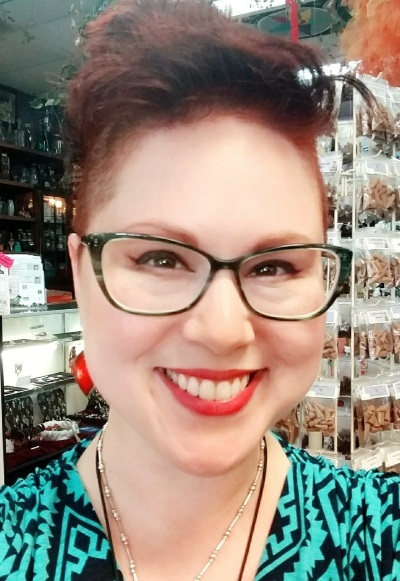 Her tools (or as she calls them, “co-workers”) include both the Russian Gypsy and Deviant Moon decks, along with her pendulum and a fun version of the Rider Waite Tarot deck. If you’re not looking to have your cards read, April can just as easily read your palm. A skilled palmist, April reads both hands: dominant for your present life, and non-dominant for your most previous life. No matter which method you choose, April always makes sure that her guests have an engaging, entertaining, illuminating, and often surprising and uplifting experience with her. Both your comfort and privacy are of utmost importance. 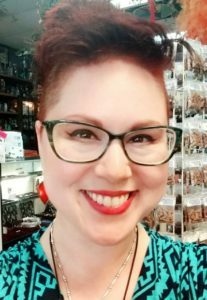 April will be at Alchemy and Ashes every Wednesday from 12:30 pm to 6 pm.